As musky hunters gain experience, it's common for them to seek new challenges in the form of more or bigger fish, and this may mean moving on to unfamiliar waters. This video - available in DVD format only - will give you the knowledge, confidence and techniques to find that waters that hold the muskies you want to catch, how to learn those lakes quickly, and start catching fish. 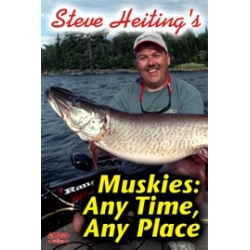 "Muskies: Any Time, Any Place" contains 13 musky catches up to 30 pounds and is Steve Heiting's second video as he follows up his popular "Muskies On The Move".